I moved in with my boyfriend this past summer. Before you imagine some cute recent college grad in her first adult relationship, no. I’m a divorced mom who had lived in the same Brooklyn apartment for nearly 20 years. And you can imagine what that means: I had some baggage. Literally! I’m talking tons of stuff I had accumulated over the years, somehow crammed into my tiny space. And since my beau and I were merging assets into one apartment with minimal storage, that meant I’d have to let go of a lot of my possessions if I had any hope of making this cohabitation situation work. All told, by the time I moved, I got rid of 50 garbage bags’ worth of stuff (some of it given away, much of it trashed). And then, once I moved in, I threw out 15 or so more bags of junk. Who knew so much junk could fit into a 550-square-foot apartment? By letting go of it, I learned a whole lot about myself. Here are a few surprises I encountered that could be in store for anyone embarking on a pre-move purge. Before this point, I always prided myself on being vigilant against collecting stuff. I had no freaking idea. 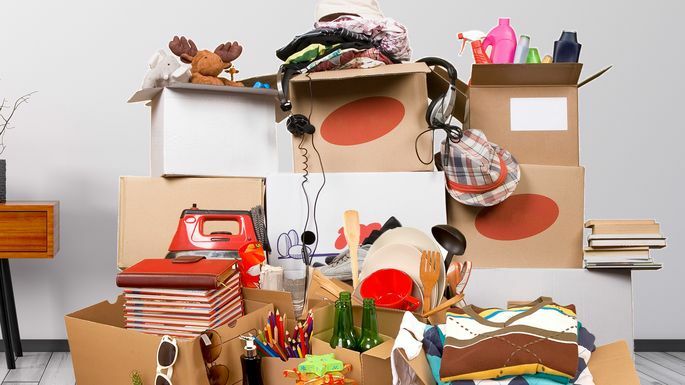 Moving actually offers the perfect motivation to get rid of things by prioritizing what really matters. Take, for instance, my vast collection of cookie cutters. I had to face the fact that I actually despise baking cookies. I don’t even like eating them. I had all those cookie cutters only because I thought they were something a good parent keeps around. But guess what? I never used them, and my kid seems to be OK. When you put something in a cardboard moving box, you’re saying, I value this thing enough to take it with me to a new place. And as it turns out, not a lot of stuff is worth the haul. Looking at some of the discards made me want to call a therapist. Like the ambitious knitting project I never finished, like so many other big projects. And the expired medicine for my ex-husband’s digestive ailments, which he didn’t bother to take with him—apparently it was our marriage that was making him sick. Actually, throwing out these items was therapy in itself. Look, I’m not anti-stuff. I’m just anti-crap-you-don’t-really-care-about. Find the objects that spark joy (yes, I’m paraphrasing Marie Kondo because she’s right), and trash the rest so it doesn’t get in the way of the joyful stuff. For instance, I got rid of all my barware except for three Waterford crystal goblets. All those mismatched wine glasses, chipped martini glasses, cordial glasses, and brandy snifters for the brandy I never remember to buy? Gone. And now I can feel so very fancy drinking out of my fine crystal that’s within easy reach. I know it seems wasteful to trash something, only to eventually buy it again. But it’s surprising how many tossed things I haven’t replaced, months later. As a writer, of course I collected books. But how many of those books did I love so very much that: a) I knew I’d read them again and b) I knew I’d need to read them so urgently that I couldn’t even wait to check them out of the library? Or buy a new copy? Wow, not very many at all. OK, there is a risk that you will throw out something you can’t replace, like the Holly Hobbie Christmas stocking my mother sewed for me when I was a child. I’m also still missing my Social Security card. This will almost definitely happen no matter how careful you are. But if that risk is keeping you from cleaning out your closets, just remember: Life will go on. Yeah, you’ll miss the thing. But you’ll find other ways to be happy. So go on, enjoy throwing away your life. Make “toss it” the default whenever you’re stuck. Enjoy the reckless thrill of letting go and starting over—and don’t be surprised when it all starts building up again.